So if the holiday season snuck up on you all of a sudden (hi, me) and now you're like >_< don't be scurred! You can still get some rad last-minute gifts AND support your fellow Pinxys with our holiday shopping guide, hella win-win stylez. Amelia Brooklyn is a collection of ceramics, apothecary, and other items handcrafted by Erica Recto in Brooklyn, and inspired by travels, her island ancestry, and day-to-day life. Her ceramics are handmade and one-of-a-kind, and she uses only organic, wild crafted, and when possible, sustainable ingredients. Some of our favorites: Tala Highlighting Balm ($26) named for Tala, Tagalog goddess of the morning and evening star, this all natural, never-tested-on-animals balm gives you subtle, buildable shimmer; One-of-a-kind handcarved stoneware pipes ($28) that are made to look like you're smoking out of a gemstone (!! ); and beautiful Palo Santo gift sets ($41) that come with Palo Santo/Frankincense spray, a stoneware feather dish, and sticks of Palo Santo all gift-ready in a recyclable cardboard box with shredded paper filler. From now until January 20th, 10% of Amelia Brooklyn's web sales will be donated to Planned Parenthood, the ACLU, Standing Rock Legal Defense Fund, and the Sierra Club. Giving super unique handmade gifts and donating to organizations that support women, the environment, and indigenous rights?! Done and done. VINTA Gallery carries their own line of bespoke and ready-to-wear modern Filipiñana fashion & accessories, designed in Toronto and ethically produced at their atelier in the Philippines. Their gorgeous, well-edited collection of dresses, modern terno and barongs might take six weeks to get to you (buy yourself a lil sumtin and be hella fly in February) - but they have plenty of ethical gifts you can get and give right now, like this unisex hand-loomed Ifugao poncho ($90) or hand-cast brass bracelet sets ($35) made by T'boli and Ifugao artisans. 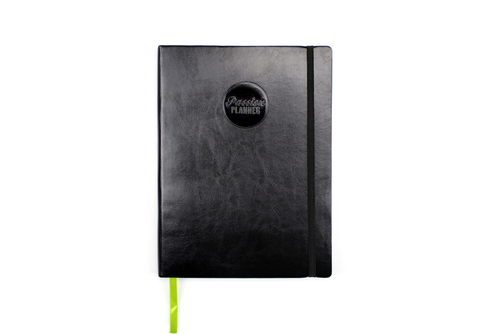 Passion Planners are amazing gifts for those people in your life who write everything down and are hella organized or who need to be (everyone?!). Created by Angelia Trinidad in 2013, Passion Planner makes awesome planners that help break down long and short terms goals into more actionable steps and encourage incorporating these steps into daily life. They're broken up into sections like "Passion Roadmap" which helps create a roadmap and step-by-step gameplan to achieve goals, pages with weekly and monthly layouts, and spaces for reflection. They come in Academic, Dated, and Undated versions, from sleek, basic black for minimalists, to colorful and embossed Limited Editions. Prices range from $25-35, depending on size, which are Classic (8.5"x11") and Compact (5.5"x8.5") and they're all animal and vegan-friendly in soft and durable faux-leather. In 2015, Passion Planner became a Get One, Give One Company - so for every planner purchased, they give one away to non-profits like Habitat for Humanity, the Peace Corps, Boys & Girls Clubs, and The Make-a-Wish Foundation among many others! Palengke Shop is a Seattle pop-up shop of Filipino-themed handcrafted gifts and goods brought to you by the makers of Hood Famous Bakeshop, Food & Sh*t, and Make Look Good that's set up through December 30. Can't make it in person? Fear not, they have some of their wares available in their online shop, like calamansi hotsauce ($9), pickled ampalaya ($12), Food & Sh*t mugs ($12), and our personal favorites "Did You Eat Yet?" poster ($20) and buttons covered in malong fabric ($4/each). You can also now purchase from Hood Famous Bakeshop directly to get fair trade Kalsada coffee beans ($17.50), polvoron DIY kits ($24.95), their famous ube cookies ($24), and yuzu ($9.95) and calamansi jelly ($7.95) with guaranteed arrival by 12/25 if you order by this Monday 12/19! Enamel pins have been making a huge resurgence in the past couple of years, and we've been seeing some super cute versions that make it extra easy to rep (and share) our Pinxy roots. Chicago-born, Oakland-based graphic designer & illustrator Bryan "Peabe" Odiamar has teamed up with Slushcult to create these hella adorbs enamel "Halo-Halo" pins! Part of Peabe's "Filipino Pack," which also includes balisong pins and collabs with legendary Pilipino turntablist crew Invisibl Skratch Piklz, you can get the original colorway from Peabe and the neon colorway from Slushcult.